Old-school organization and business processes were built around repetitive, manual, paper-based workflows. But today, agility, flexibility, and precise execution make the difference between success and failure for almost any enterprise. A workflow automation solution digitizes and automates repetitive processes, especially manual and paper-intensive ones, so you reduce or eliminate the “pain of the mundane” – errors, delays, compliance problems, high administration costs, and the deadly tedium that creates employee engagement issues – while accelerating process speed and boosting productivity. What does Connie Brenton, CLOC Chair and Chief of Staff/Senior Director of Legal Ops at NetApp have to say about workflow automation? Let’s walk through some of the benefits workflow automation can deliver to nearly every organization. First and foremost, it pays off. Just like e-billing, it’s a quick win for your organization that provides near-immediate ROI. It also helps prove your case for digital transformation and gain executive-level buy-in for future legal technology adoption. In fact, CLOC leaders and other Legal Ops leaders at top corporations have cited workflow automation as one of their top three software solutions to deploy for growing legal departments searching for quick wins. What are the major benefits of state-of-the-art workflow automation? Improved security and compliance. Automatically record and audit all employee actions within a workflow, safeguard vital data, restrict access and roles of users and alert project owners when any problems arise. Centralized documents and access. With manual workflows, there’s no such thing as a centralized document database. However, with a single, unified database, documents, forms, workflow records, and other assets are readily available and never lost. Adoption without disruption. Adopting workflow automation allows seamless integration with existing digital infrastructures and legacy systems. The right tool can stitch everything together and eliminate the need for multiple tracking systems. Improved teamwork and morale. A good workflow solution removes barriers to collaboration across teams and departments. By driving efficiencies so a team spends less time on manual tasks and more time on their actual jobs, workflow automation drives productivity, process value, and can actually inspire happier employees. Just What Are the “Pains of the Mundane”? The cost, waste, and risk associated with manual processes (and even with inflexible last-generation workflow software products) are significant. Even mind-numbing, when you consider the scale of some enterprises and the number of processes being executed in a day, a month, or a year. 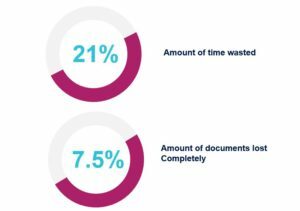 According to IDC, workers waste 21% of their time searching for lost documents or handling other document-related errors and issues. 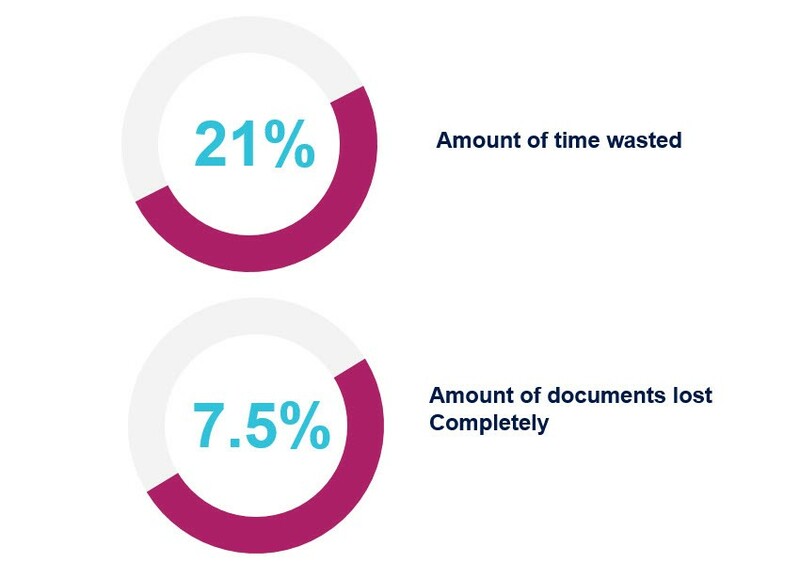 Yet 7.5% of all company documents are lost completely, but the only way you know it is by wasting time and money searching for them. Consider that Connie Brenton and the aforementioned NetApp are saving over $3.6 million per year after introducing workflow automation – and that’s only from a single feature, e-signature integration – and the upside for many organizations becomes obvious. Yet the costs to an organization of obsolete processes go beyond just dollars or euros. Tedium, paper-pushing, and the demands of manual processes wear down enthusiastic and engaged employees to the point they may as well be robots – but more prone to error and risk than the mechanical kind. What Does Workflow Automation Mean for Legal? All those benefits sound great, but where do forward-looking, ROI-minded corporate legal departments apply workflow automation? Actually, any list like this barely touches the surface. In our own experience, legal users who are presented with the right workflow automation solution – one that’s Cloud-based, easy to deploy and learn, and flexible and adaptable enough to allow them to design their own answers to process problems – innovate like crazy. So nearly any process any of us imagine can be automated, even the most complex. Moreover, workflow automation can be extended beyond the legal department. Connie Brenton’s team found that out, as other departments began asking them for help in automating their own processes. That’s an opportunity to not only help other teams accelerate their workflows, but to ensure legal best practices and compliance are embedded in their processes. When the workflow solution is integrated with a company’s main platform, this means the latter’s legal management virtues can be extended practically everywhere. Let’s zoom back to NetApp one last time. The pressures being applied on Legal Ops teams to run legal like a business mean it’s vital to extract optimum efficiency from every process. In NetApp’s case, one major wastrel was the NDA process (it could be any other client document in your firm: CIV, Engagement letter, Invoices, HR documentation, other agreements). Prior to launching an automated NDA workflow, the turnaround time for a single NDA at NetApp was 3-5 days, though sometimes it ran to as much as 30 days. As a result, Legal was forced to focus vital resources – namely, lawyers and legal staff – on manually managing and vetting a low-value, low-risk process. But one still essential to the organization. By implementing an automated NDA solution however, NetApp increased the speed of processing their NDAs by a whopping 350%. What are some of the benefits bound up in a number like that? First off, creating online, self-guiding NDA request forms eliminates erroneous submissions, so legal staff needn’t review or correct them for mistakes. Requests are automatically routed for approvals, and automated notifications remind approvers to play their part in the process. NDAs get automatically archived, maintaining a secure audit trail. Approval of an NDA can trigger subsequent workflows, such as HR onboarding, access to content, or others. In just a short time, NetApp was enjoying an automated process handling 85% of NDAs, minimizing involvement by legal staff. Over the span of just five years, NetApp saved over 101 years of turnaround time. That’s a huge reduction in salary, wasted time, and paper cuts. Some fret about the impact of anyautomation tool on their profession or business, and the potential they imagine for job loss or “mechanization” of their workplace. In the legal industry, the net effect is often the exact opposite: automating repetitive tasks, including common workflows like NDAs, frees lawyers and legal staff to devote their considerable talents to more vital and profitable needs. That drives an improvement in legal services, which can now be delivered more responsively, yet with lower cost and greater efficiency. That, in turn, quite often results in more work for the legal department. Even a lot more work. When Vodafone revamped its in-house Legal Ops team to focus on enhancing efficiency and time savings, the company found it had to actually grow its legal staff – from 35 in 2014 to 80, with 50 of them attorneys – because of the amount of work they could now do thanks to the efficiencies enabled by legal technology. To sum up: Legal workflow automation is a cornerstone technology for a corporate legal department interested in improving their performance, responsiveness, and ROI, in becoming a better partner for the rest of the company, and in gaining a better seat at the leadership table within their organization. In the modern corporation, that outcome alone is why adopting workflow automation has become an absolute necessity for legal departments with their eye on the bottom line – and the future.